I arrived in Spain in early December. The temperatures were still mild and the Deer where still Routing. For this hunt I had used local contact Luis Jaure CEO of huntingspain.com. With Luis we had selected a hunting area managed by German and Pedro about 4 hours south of Madrid. 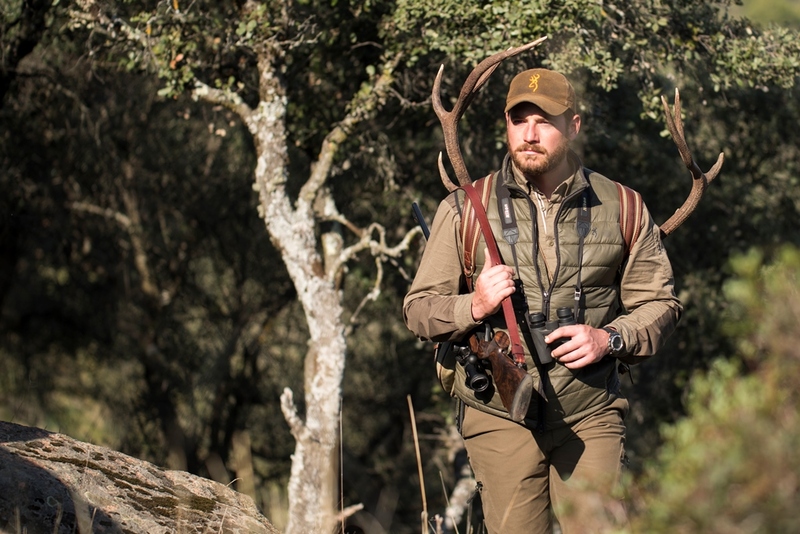 I want to thank Luis for the great organisation and professionalism now because in this article I am going to spend more time describing my experience with the Browning Maral Monte Carlo 30-06. This was my third hunt with the Maral. By now, I had stress tested it in extreme low conditions in Sweden. This caused no problems and the barrel was still floating. The bolt stayed moving freely and also the Magazine and Magazine release did not act any different in -0 Celsius temperatures. When I arrived in Italy I gave it and over hall and I used some of the shelf gun oil and applied a very light layer everywhere on the stock and the fore-end. After a quick clean it was time for some humid Italian weather with rain. Since I was Wild Boar hunting my hands where always dirty of soil and let me tell you the soil in Tuscany stick like that silicone tube called 007. At the end of the hunt I was embarrassed to show the Maral because it looked like an old stick wish fresh mud on it. Anyway, when I went back to the Cottage I gave it a quick rub down and put her in the travel case and made my way to the airport. Destination Madrid. So here, I was at the hunting lodge in Spain. Temperatures were in the mid twenties. We all know if the wood is not been, treated appropriately by now it should start to give in or give signs of movements. However, the Maral was there resting in top of the travel case looking at me as if it wanted more torture. I was there just to give it that. The next morning we started our hunt at sunrise and it was amazing to hear the local Deer still in the routing season. With Pedro and German we walked some of the area and I was surprised by the quality and quantity of animals. It had not rained for a year in that area and there was a lot of dust with hot weather. The animals were a bit under stress. They were waiting for the raining season. That made everything harder for us. Me, two Spanish guides and the filming crew behind me with big cameras and tripods did not go down to well. Every time we got at about 350 to 400 meters away they would spot us and move. Our aim was to get a clean shot at no more than 200 meters since I had a 1.2 to 6 variable optic. After two days, the guides were frustrated with all the opportunities that we had missed. A decision was to be made. That evening while having dinner, I said: “ Tomorrow. Let’s aim for a clean shot… Between 350 to 400 meters!”. German and Pedro nearly choked with the mouth full of beer. After a few minutes they replied. “It isn’t impossible, but very hard”. I was aware that I was asking a bit too much from my skills, by now I knew the trigger action on the Maral and I was comfortable with it. It wasn’t our first hunt together. We had placed some nice bullets in the previous hunts and I thought we where ready for this challenge. So here I was the next morning at sunrise out for our third hunting day. Pedro and German had decided to change area and try to arrive to a small opening that over looking on the side of a mounting. They knew that the distance from the opening to the side of the mountain between 320 to 430 meters. The only thing that was going throw my head was: “Why did I say that last night”. Arrived at the opening the filming crew set up the entire camera equipment and were ready to press REC. Me, German and Pedro were checking out with our binoculars the side of the mountain. Sunrise was over and the light was hitting us directly so we could not move too much. The mountain was still in the shade when Pedro spotted some females moving. He got my attention throwing small rocks at me. He gave me the signal to get ready. My heart, went from normal to race mode. I knew I had to slow it down. I closed my eyes for about a minute and started breading in and out with long but slow breaths. Then I reopened my eyes. I was resting on the ground using my hunting backpack as rest for the Maral, my elbows were solid on the ground and my feet had a good grip. My scope was at its max 6 magnifications. German had moved beside to instruct me on the Stag since there were a few by now moving in the area. I was rubbing my finger to increase blood circulations so to make it more sensitive. Red dot was on, even at it lowest setting it was to big at that distance so I decided to turn it off. That gave me a better visual of the Deer in the reticle. German had pointed to me a nice male with 14 points. He was, 415 meter away, slowly moving down the mountain with all the females in front. He was that far that even the filming crew with a 600 mm lens and digital magnification could not see him. If, the filming crew did not have him on camera I could not take the shot. So we had to wait for them to find him. Pedro had moved back and now was showing to them where the animal was. After a few moments: “we have him, we have him”. Now it was only minutes before he moved closer. At 390 meters, we were still waiting. At 380 meters I released the safety and now it was time. He was walking slowly without stopping. He was smart, every time he stopped; he always had a tree or a rock obstructing the trajectory of the bullet. Stressful moments. German was calling the distance at even intervals. German whispered 360 meters and touched me on the shoulder saying: “now or never my friend”. That was the moment to make history. I could not do it on my own it had to be a team success. My hand started squeezing the stock so to take the tension away form the finger. I was going throw my vertical movements while increasing the pressure on the trigger. I kept saying to my self. “Come on Maral we need a clean shot”. The noise, the recoil. My eyes blinked. Being so far away, I had the time to focus again on the animal. The bullet made impact with him a little high on the shoulder. He arched his back, went a step forward and then down he went. German and Pedro where shouting at me and hitting me on the back. I had reached such a high level of tension and adrenaline that my ears were out of service. The feeling was that overwhelming that I did not know to take it. Smile? Keep a serious face? I decided to reload. For a few more minutes I was looking at him. Then, I got up unloaded the Maral and gave her a kiss. I hugged German and Pedro. Thanked the filming crew and started our walk towards the Deer to serve him some respect. A nice male with a Trophy of 14 points was there. The Maral and me had bonded once again. A few pictures were taken and then we dragged the animal to a close mountain roadway. Since I had to return to Ireland the following day. We decided to take some loin cuts. With some of it we did a Carpaccio and the remainder was pan-fried. We spend the afternoon talking about the previous three days and that shot. I must have asked the filming crew to rewind and show me shot 100 times. Later that day, I had the rest of the Deer cleaned and bagged. The Trophy was prepared localy and then shipped to my address in Ireland. Now it was time to head home to Ireland to spend xmas with my family. Before I go, I would like to say that only in extreme conditions a hunter should take a long-range shot. The meaning of stalking is not how far you shot it, but how close you can get to it.